On 9 January, AVO reported that unrest at Little Sitkin had decreased over the past several months, reaching background levels. The Volcano Alert Level was lowered to Normal and the Aviation Color Code was lowered to Green. AVO reported that during 17-23 October seismic activity at Little Sitkin remained elevated and satellite views were mostly obscured by clouds. AVO noted that there were no other reports of unusual activity. The Aviation Color Code remained at Yellow and the Volcano Alert Level remained at Advisory. AVO reported that during 19-24 September seismic activity at Little Sitkin remained elevated and satellite views were mostly obscured by clouds. On 21 September AVO noted that the frequency of earthquakes had declined during the previous week. The Aviation Color Code remained at Yellow and the Volcano Alert Level remained at Advisory. AVO reported that during 11-18 September seismic activity at Little Sitkin remained elevated and satellite views were obscured by clouds. Two earthquake swarms were detected on 11 and 13 September. The Aviation Color Code remained at Yellow and the Volcano Alert Level remained at Advisory. AVO reported that during 5-11 September seismic activity at Little Sitkin was much lower than the peak of activity during 29-30 August, but continued to remain elevated. Satellite views were obscured by clouds during 5 and 8-11 September. The Aviation Color Code remained at Yellow and the Volcano Alert Level remained at Advisory. The Global Volcanism Program has no Bulletin Reports available for Little Sitkin. Diamond-shaped Little Sitkin Island is bounded by steep cliffs on the east, north, and NE sides. Little Sitkin volcano contains two nested calderas. The older, nearly circular Pleistocene caldera is 4.8 km wide, may have once contained a caldera lake, and was partially filled by a younger cone formed mostly of andesitic and dacitic lava flows. The elliptical younger caldera is 2.7 x 4 km wide; it lies within the eastern part of the older caldera and shares its eastern and southern rim. The younger caldera partially destroyed the lava cone within the first caldera and is of possible early Holocene age. Young-looking dacitic lava flows, erupted in 1828 (Kay, in Wood and Kienle 1990), issued from the central cone within the younger caldera and from a vent on the west flank outside the older caldera. Fumarolic areas are found near the western coast, along the NW margin of the older caldera, and from the summit crater down the southern flank for a 1 km distance. Snyder G L, 1959. Geology of Little Sitkin Island, Alaska. U S Geol Surv Bull, 1028-H: 169-210. There is no Deformation History data available for Little Sitkin. There is no Emissions History data available for Little Sitkin. Snow-covered Little Sitkin volcano rises beyond Williwaw Cove on the NW side of the island. The sharp-topped unnamed peak at the left is part of the Williwaw Cove Formation, consisting of Tertiary to Quaternary lava flows. Two nested calderas lie between this peak and historically active Little Sitkin; the younger of these may be of early Holocene age. The older Pleistocene caldera, whose low rim lies just beyond the thin cloud bank in the center, may have once contained a caldera lake. 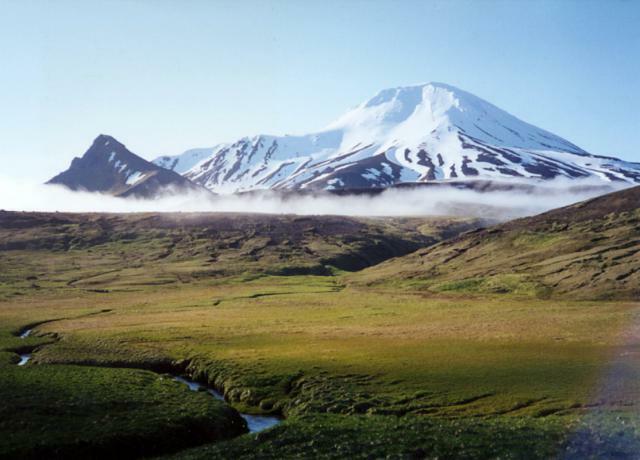 Large Eruptions of Little Sitkin Information about large Quaternary eruptions (VEI >= 4) is cataloged in the Large Magnitude Explosive Volcanic Eruptions (LaMEVE) database of the Volcano Global Risk Identification and Analysis Project (VOGRIPA).